Though Peter Griffin biography could seem to be rather boring and lack of different exciting moments, he is considered to be one of the most noticeable figures in the world of blackjack, as he made a lot for this game’s improvement and development. His life can be described as calm and quite but very peaceful and interesting for Griffin himself as he did what he loved most – teaching. Peter A. Griffin was born in 1937, in New Jersey. His father and grandfather were both connected with the world of mathematics, so it was not surprising that Peter had become interested in math and numbers from the very childhood. His father was an actuary (he was the manager of an insurance company) and his grandfather was a mathematician at college and the author of many math textbooks. There were three kids in their family, so Peter had a brother, whose name was Alan, and a sister, whose name was Barbara Dann. As for education, Peter Griffin was the undergraduate of Portland State University, and afterwards he went to California State University to get his Master’s degree where he stayed to work after his graduation as a teacher of statistics and calculus. It was actually his only job and he taught there during the whole his life. Peter had a wife Lydia, whom he married with when studied at Portland, Oregon. The year of 1970 is considered to be the one when Peter Griffin got acquainted with the card game of blackjack: he was proposed to teach a class about the gambling statistics at the university, so he had to go to Las Vegas, Nevada, to make researches about this topic. Well, this first acquaintance did not give Peter anything good but just disappointments and failures but, as a matter of fact, these failures gave him strengths to go ahead and finally beat the game of blackjack! Being a great mathematician, Griffin was able to become a wonderful card counter even at the very beginning of his acquaintance with it: he could make 6 counts at one time while other card counters were able to make only 1. Anyway, Griffin considered all this counting system and blackjack itself to be rather boring and he just did not want to spend much of his time at the blackjack table: he observed blackjack players, compared them and different casinos, made many calculations and proved that every player of blackjack had a disadvantage of 2% against a casino. So, Peter Griffin decided to invent and develop strategies and different methods which could help a player to beat casinos, and he made it with the help of his works. 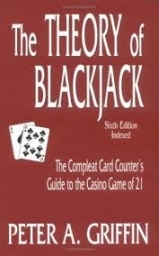 In 1978, Peter Griffin wrote his first book, The Theory of Blackjack which made him popular in the world of blackjack: more than 700 thousands of copies were sold, and this book still remains popular for everyone who is interested in card counting;The Theory of Blackjack is considered to be a classical book about blackjack which stands at the same level with Beat the Dealerof Edward O. Thorp. 1991has brought us one more book of Peter Griffin which was called Extra Stuff: Gambling Ramblings. Moreover, Peter is the author of numerous articles on the topic of gambling and mathematics which were published in many mathematical journals. As we can see, the world of blackjack remembers Peter Griffin as a very talented author who presented us two wonderful classical books and many articles on the topic of this card game. Though blackjack was not Griffin’s main passion, he was deservedly chosen as one of the 7 initial members of the Blackjack Hall of Fame in 2003. Unfortunately, Griffin was honored to the Blackjack Hall of Fame posthumously: he died in 1998 because of prostate cancer at the age of 61. Peter Griffin continued to be the teacher at California State University till the very end; teaching always stayed to be the main passion of his life.